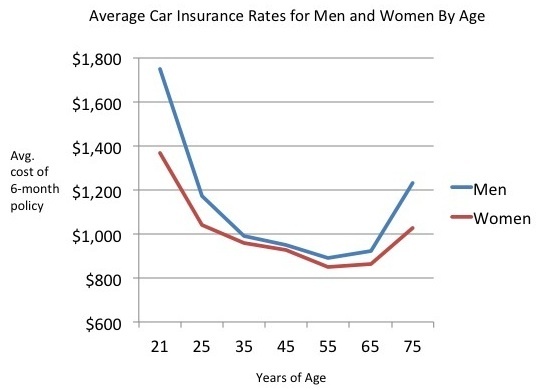 In a previous post we shared data on how car insurance prices change as a woman ages; now it’s time for the men to get the treatment. The data, as per usual, is interesting. -No surprise here. “Men” aged 21 pay the most, followed by 75 year-olds who, have their own unique challenges on the road. -Men pay the least car insurance at age 55. The bell curve is very to similar to that charting the womens’ coverage rates. While the bell curve is similar and men generally pay more for car insurance than women do -- about $15,000 more over the course of a lifetime -- you can clearly see that we gents are a bit more risky (wild?) as 21 year olds. We do a nice job of settling down in adulthood; with the kids in the back seat, we drive more slowly and carefully and the data shows our policy costs inching toward those of the women. Lastly, we’re all more risky to insure in our golden years, but women must less so. Women are less expensive to insure because they make fewer and less pricey insurance claims. The differences are clearly greatest for our youngest and oldest drivers.